The demand for water will continue to rise considerably. Meanwhile, however, the availability of fresh water resources is diminishing owing to contamination, sinking groundwater levels, dried-up wells and climate change. Over the last 30 years water consumption in the USA has trebled, whereas the population has grown by only 50%. Global water consumption doubles every 20 years, more than twice as fast as population growth. Current trends suggest that, by 2025, a third of the population will have no access to clean drinking water. The global world market is estimated by Goldman Sachs (2008) to be worth around 425 billion US dollars, with a long-term growth of 4%-6 %. In industrial markets an average growth of 3%-5 % (USA and Western Europe) is expected through an improvement in existing water and wastewater infrastructure within 5 to10 years, compared with 10% or more in developing markets (China and India) through the creation of a new water and wastewater infrastructure. Owing to the substantial imbalance between supply and demand, the strongest growth areas in the global water market will come from high-end water treatment technologies, like membrane filtration and reverse osmosis desalination. Membrane filtration eventually can lead to a considerable reduction in water treatment chemicals, such as chlorine. 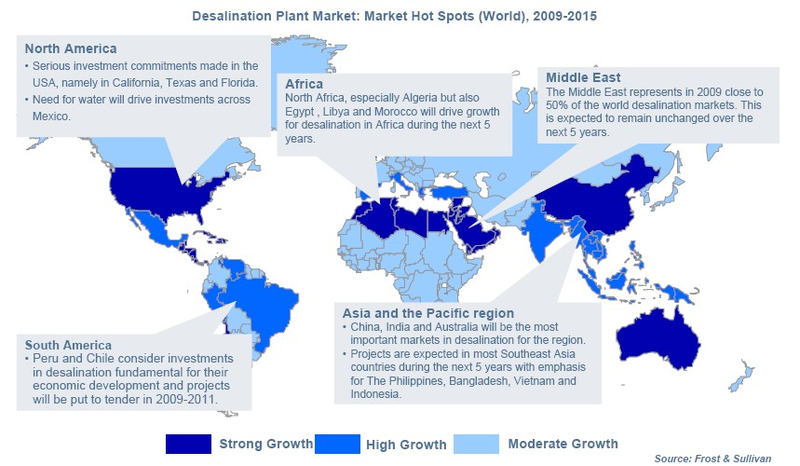 Of the more than 12,500 desalination plants in operation or in construction worldwide, 60 percent are located in the Middle East and North Africa (MENA). 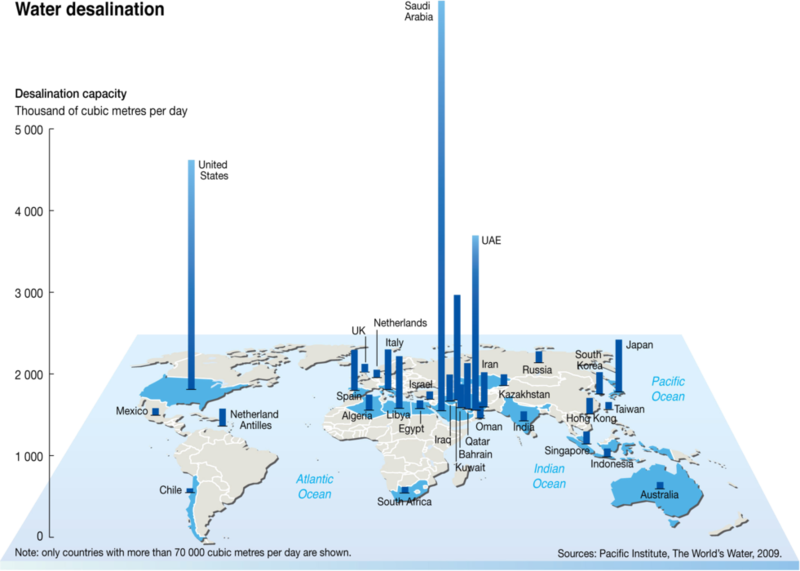 The above figure illustrates various countries’ usage of desalination. Worldwide usage of water is expected to further grow with climate-induced water stress combined with population growth, industrialisation in developing countries and as desalination technology becomes cheaper due to higher efficiency, economy of scale for larger installations, etc.